During Blair’s speech, in the section headed international security, Blair presents a typically pontificating argument in which he seems to outline both the pros and cons of military invasion (aka intervention) against a sovereign nation that had not threatened Blair’s own nation, nor the safety and security of Britain’s allies (the US in particular). In this posting, I want to take a very brief look at the history of the founding of America’s Central Intelligence Agency and provide quotes from an American president regarding his views on the CIA and what should be done to control its seemingly unfettered powers. 1.) Office of the Coordinator of Information (COI) – Established July 11, 1941 – duration of 337 days. 2.) 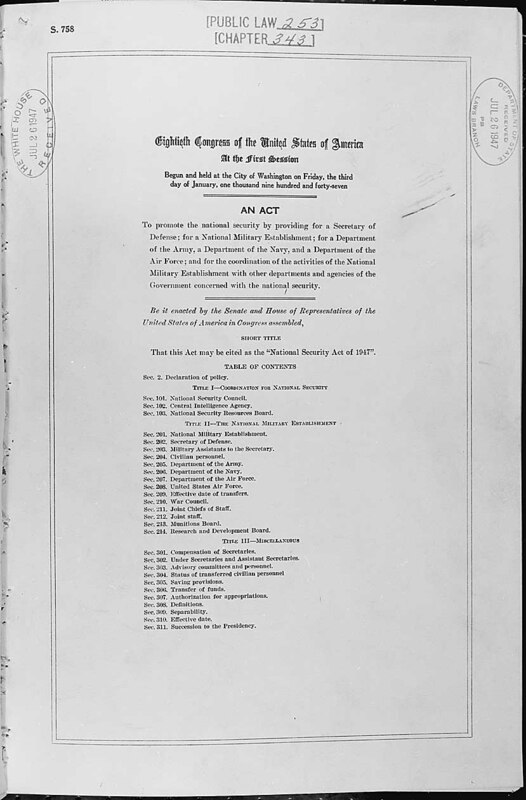 Office of Strategic Services (OSS) – Established June 13, 1942 – duration of 3 years and 3 months. 3.) Strategic Services Unit (SSU) – Established October 1, 1945 – duration of 1 year and 5 months. 4.) Central Intelligence Group (CIG) – Established January 1946 – duration of 1 year and 6 months. 5.) Central Intelligence Agency (CIA) Established September 18, 1947 – duration 71 years. 1.) coordinating, planning, evaluating and disseminating intelligence. 2.) capability to clandestinely collect information. 3.) authority to conduct independent research and analysis. 1.) advise the National Security Council (NSC) on matters related to national security. 2.) make recommendations to the NSC regarding the coordination of intelligence activities of the Department. 3.) correlate and evaluate intelligence and provide for its appropriate dissemination. 4.) perform such other functions as the NSC will from time to time direct. By 1953, the Agency was an established element of Washington, making contributions in the areas of paramilitary warfare and political action. The Home Guard – National Security Forces (Swedish: Hemvärnet – Nationella Skyddsstyrkorna) is a military reserve force of the Swedish Armed Forces.